In an announcement that seemingly came out of nowhere, Vice President Joe Biden said Monday that he'll be running for president in 2020. Sure, he put out a bit of a caveat there, adding that he's "not committed to anything" one way or another. But he did say the words, "I am going to run in 2020," and in my book, that counts as an announcement. It's laughably early to be even thinking about 2020 candidate, but Biden has forced everyone's hand here, so let's do it: If he actually does run in four years, Biden should pick Barack Obama as his running mate. Yes, it sounds absurd. But so does the idea of Biden running for president in 2020, so let's entertain the notion. For one, the two men obviously get along very well (Biden actually got Obama a friendship bracelet for his birthday). More importantly, Obama is very popular for an outgoing president, and as a general rule, presidents become even more popular after they leave office. By "flipping the ticket" and choosing his former boss as his vice president, Biden would absorb some of that Obama magic, which would undoubtedly boost his chances in November. What's more, Democrats don't have a terribly deep bench for 2020. There are a handful of rising stars here and there, but none with the star power, charisma, or proven track record of success that Obama possesses. Also, Biden will be 78 by the time his 2020 campaign rolls around, which means he'll face pressure to choose a younger running mate. Obama won't even be 60 at that point, making him a veritable spring chicken compared to Biden. For Obama's part, running for vice president would let him return to one of the things he's best at: campaigning. One of the traditional duties of a vice presidential candidate is to play attack dog against their opponent, and Obama makes a great attack dog when he wants to be. Moreover, Obama is a guy who clearly just loves campaigning in general, and vice presidents do a lot of campaigning. This is largely because they have almost no official duties, other than breaking ties in the Senate and assuming the presidency if necessary (more on that later). As vice president, Obama would have plenty of time to hit the road and promote infrastructure projects, or cancer funding, or whatever policies President Joe Biden decided to push for. But wait, you're thinking, what about term limits? The vice president must be capable of assuming the presidency at a moment's notice in the case of an emergency, but Obama has already been elected to the presidency twice. Doesn't that mean he wouldn't be able to step in as POTUS if, God forbid, something happened to a President Biden? See that? The amendment prevents anyone from being elected to the presidency more than twice, but nothing in that language precludes a former two-term president ascending to the presidency through other means. Still, there is the small matter of the Twelfth Amendment, which states that "no person constitutionally ineligible to the office of President shall be eligible to that of Vice-President of the United States." The language there is vague — it's unclear whether "ineligible" means ineligible to be elected or ineligible to serve, which is the salient difference here. So yes, it is possible that a Biden-Obama ticket could lead to a small Constitutional crisis. But we're putting the cart ahead of the horse. 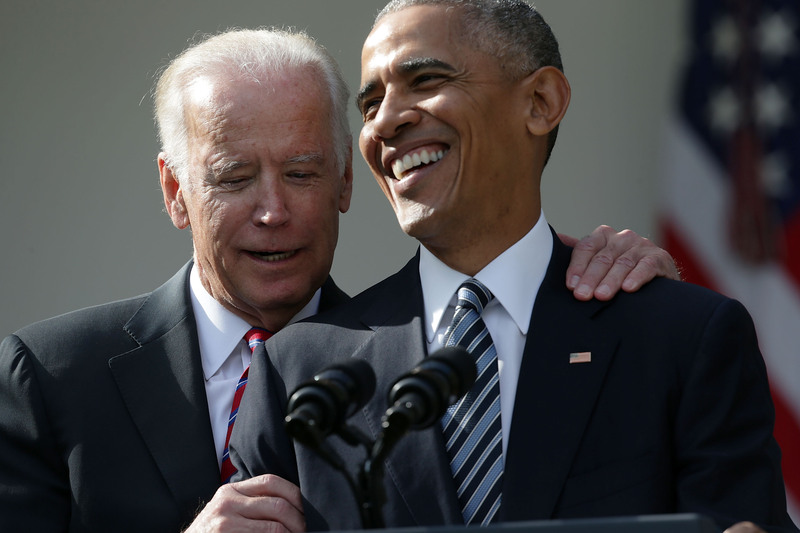 If Biden and Obama run and win in 2020, this will be after four years of Donald Trump, who will have become president despite receiving 2.5 million fewer votes than his opponent. If America can survive something that outrageous, it can surely survive the possibility of Obama ascending to a third term through Constitutionally-questionable means. It's too soon to say for certain what factors Biden will have to consider when choosing a running mate in four years. But when compiling his VP shortlist, he should seriously consider tapping the 44th President of the United States.